I think they say the first step in any of those self-help programs is admitting you have a problem. Denial is not serving us any more. Let’s face it. In Canada we have all the same stuff as they do in the USA. We have the same terrible, sprawling cities; the same crappy, ugly, toxic, plastic houses; the same mandatory vehicle ownership**; the same fracking frenzy; the same obsession with wireless communication; the same large-scale, industrial, chemical, feed-lot, GMO farming practices, (in contrast, I read the other day that what is considered a ‘massive’ cattle farm in the UK is 100 head,) our food travels further, we use the same pharmaceuticals, watch pretty much the same TV, we burn coal; leave the lights on, love fast food, shop at big-box power centers, etc. etc. And yet, we won’t admit we have a problem. We walk around every day basking in our greatness. Our superiority as people; as a nation. And we have the nerve to constantly blame everyone else for our problems. In the South Park movie, they satirized this Canadian trait of blaming our neighbors for all of our problems with their classic ‘Blame Canada’ song. Satire has become fact (if it wasn’t already.) We are to blame. The new film ‘Revolution’ takes us to task. And rightfully so. This is tricky territory for us. We rely on this oil sand bonanza to live the life we are accustomed to. Without it, unemployment is higher. Without this money in the system, we have less; might go hungry. I doubt our store would make it without the extra cash that is able to be tossed around as either a direct or indirect result of the oil sands economy. 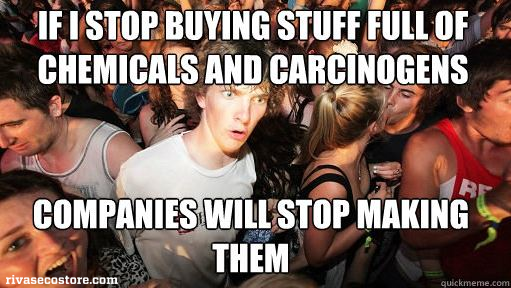 Carbon reduction hurts our lifestyle. To protest it, or fight against it is to protest against our own livelihood. This is perhaps noble and certainly idiotic. But is there any other choice but carbon reduction? Is there any choice but cutting back pollution, chemicals, energy use? If we can put aside our immediate needs and think long term, probably not. The death of the seas, (and the subsequent death of pretty much everything) is too great a consequence. One can also make the argument that levels of carbon in the atmosphere have spiked dramatically and measurably in the same time period as the petro-chemical burning frenzy of the past hundred years. Coincidence? Hey, you never know, right? Between 1000 and 10,000 species go extinct every year. Sure we remember the dodo and the passenger pigeon, but can you even name 1000 species? No big whoop? Those are big looking numbers to me. 12 – 15 million hectares of deforestation per year. A good percentage of this is burned, to make farmland, to feed hungry populations (another conundrum.) This does double duty, not only removing the forests ability to process carbon, but also releasing massive carbon stores. It’s easy to come up with big, scary numbers. I’m the first to be skeptical of ‘statistics’ and ‘facts’. But, these days, it’s a bit too easy to come up with big, scary numbers. Let’s think about changing them. Not with statistical manipulation. In real life. This means changing real life. Right now, our society is afflicted with an epidemic resistance to the idea that we might have to change something about the way we live. The overwhelming mentality is that it’s nicer to life the good life, not worry about it, hope for a miracle, and pass the blame along to someone else (politicians, neighbors, governments, other people in other parts of the world) Can we work together to fix this mindset? One of the concluding scenes in ‘Revolution’ is of a classroom of nine year olds successfully petitioning their government to shut down sharkfinning in their country. And they succeed! Q: What about alternative energy? Can’t we spend more money developing ‘alternative energy’? Etc. etc. This sentiment still runs rampant through even the most ‘earthy’ circles. This sentiment falls quite clearly into the ‘hoping for a miracle‘ mindset. It’s not that I have any problem with the idea of finding a cleaner way to have a bit power. I just can’t abide the idea that we will find a miraculous, easy way to keep living exactly as we are right now. I recently wrote an article on Earth Hour suggesting that there might be some relative joy in powering down. Maybe this is wishful thinking. Maybe you disagree. I’m still convinced that a cleaner, simpler, less electrically stimulated life can no only be ok, but actually an improvement. Q: What about such and such 100 million Americans who want to end the world deliberately so that…? Seriously dude? You just sat through 2 hours of a movie showing Canada as a top environmental offender, and this is what you got out of it? You can still pass the buck? You can still blame your neighbor? Back to my headline… ‘Canadians are the worst.’ Too negative? Perhaps. But until we get over our denial, and admit that we can do better, we won’t do better. Sure, other countries may or may not be perfect. What can we do about other countries? Apathy is boring. Let’s fix things at home first. If a class of nine year olds can start a movement that changes a country, imagine what an entire country can do for the world? Who knows. We certainly aren’t the best. And it’s not for lack of knowledge. I learned about global warming in elementary school. That was a long time ago. What have I done about it? Not nearly enough. Hopefully it’s not too late. I wan’t to be part of the Revolution.